The only time I’ve been in ‘cosplay’ was when I was about 6-7 and I won the school fancy dress competition by dressing up as Robin Hood, with the green tunic, bow and spiffy hat. My sister was Red Riding Hood – We killed it and since I wanted to go out while I was on top of my game, I haven’t dressed up since. Note that I’m not equating Fancy Dress as Cosplay. Anyway, I attended the Gloucester Comic Con on the 9th October and I have to admit that the cosplay that I saw there was amazing. Friends among the cosplayers were made and everyone had a good time. At this event was an individual named Luke Tull who was dressed as Obi Wan Kenobi on the Saturday and a steampunk Flash on the Sunday. While I didn’t really speak to ‘Barry Allen’, I did approach him for a picture and he accepted. He also interacted with my daughter who loved his costume. (Although she’s neveer seen the Flash before). As I want to be more involved with the cosplay crowd, I want to showcase more cosplayers in the UK so who best to approach first than the fastest man/jedi on earth – Luke Tull. If you want to be interviewed and showcase your cosplay, then please contact me using the contact form and I’ll send the questions over and we can conduct an interview via Skype or this website. Enough rambling – Let me introduce Luke Tull. How did you get the passion for Cosplay? I’ve been to a lot of conventions over the years and I have seen a lot of videos by Sneaky Zebra (they showcase a lot of cosplayers in their videos) and thought that id love to recreate my favourite characters. Cosplays means alot to me, It keeps me active with making the costumes and designing them. Actually seeing peoples reactions to my cosplays make it even more enjoyable! Your first cosplay – Who were you and how do you think you have grown since then? My first cosplay was a Jedi! I went for an Obi-Wan Kenobi – but looking back I actually didn’t look that much like him then! 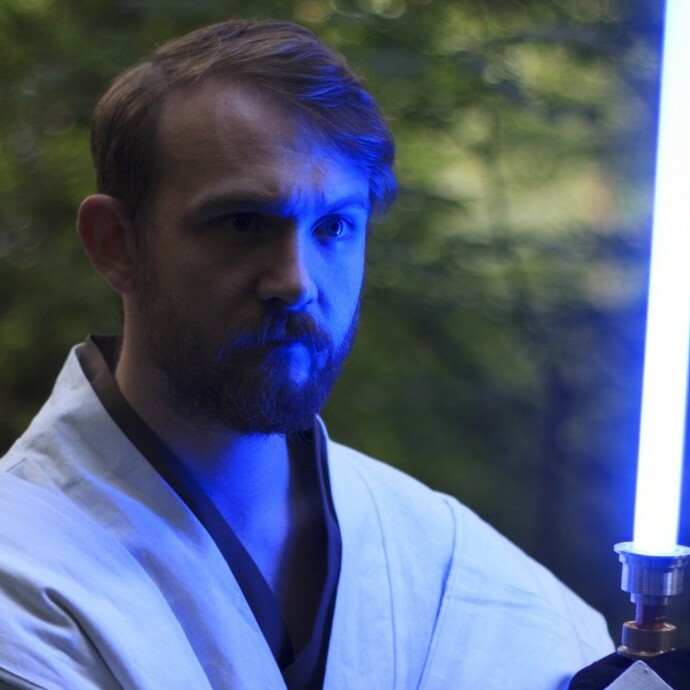 Now I feel with working on my cosplay I have achieved a more of a Clone Wars General Kenobi! Who are your favourite characters to Cosplay – Can you describe them? Ultimate character that you would love to cosplay? My ultimate character would be either Abe Sapien from Hellboy or Gambit from The X-men. From concept to completion, how long does it take to complete an outfit? I would say my average build time is less than a month – with getting the materials and then actually building it! The Flash was challenging As I haven’t ever attempted a full suit of armour. There were things I needed to work out like how I would make it all fit together! What’s the best part about Cosplaying? So many reasons and best parts but The people you meet and how much they enjoy seeing their favourite characters come to life! My favourite part overall is probably the reaction you get from children and how much fun they seem to get from seeing cosplays. I cosplay mostly as Kenobi and so many children know who I am and want a picture and seeing them happy and smiling is fantastic! What’s the worst part about Cosplaying? I think the “worst” part is how much it costs to do!! Don’t get me wrong I love cosplay but the hit it takes on my bank account is bad!! Luckily I have a very very supportive girlfriend who even helps me with cosplays and even cosplays herself! Is there anyone in the cosplay ‘industry’ that you aspire to/get inspiration from? I’m new to Cosplay, for instance I want to either do Lucas Bishop or Blade in the future, how would someone like me start? What advice would you give? JUST GO FOR IT! You need to throw yourself into it and have no fear! I have to admit that going up to people in cosplay can be quite intimidating for some people. What’s the best way to approach a CosPlayer? I don’t think there is a best way! I spent time on my cosplay and more than happy for people to just come up to me and say hello! Ask for a picture if you want one and just compliment their cosplay! Do you have any other talents that you like to showcase? Do you have any other conventions or expos that you are attending soon, how can people contact you? What do you have to say about people that comment that you shouldn’t cosplay characters that are not your build, race,etc? I’ve heard about the term Cosplay does not imply Consent. For people that have not heard of this phrase, what does that mean to you? I think it means keep your hands to yourself, If you want a picture ask, if they so no then no means no. Be respectful and polite to everyone. You wouldn’t walk up to a random person on the street because you like their top and just start snapping pictures so it doesnt mean its ok to do it at a con! Personally for me, You can take my picture if you ask and ask me questions – I’m more than happy to have picture taken and questions to be asked as I have spent a long time prepping my cosplays and its nice to be rewarded with compliments! If you liked what you read, then please subscribe to Luke Tull’s YouTube Channel and Facebook (Links in article and below). Follow me on Twitter, Facebook and Subscribe to me on YouTube where you’ll find the latest videos on boardgames, let’s play and upcoming cons/cosplayer news. Posted in Cosplay, Interviews and tagged Cosplay, Flash, Gloucester Comic Con, Interview, Luke Tull, Star Wars. Bookmark the permalink.